Stand with the Egyptian people's uprising! Stop U.S. Funding of the Mubarak Dictatorship! Stand with the people of Egypt! Demonstrations are being organized across the country in solidarity with the struggle of the people of Egypt. In Boston, a demonstration will take place this Saturday, Feb. 5 at 12 noon at Copley Square. 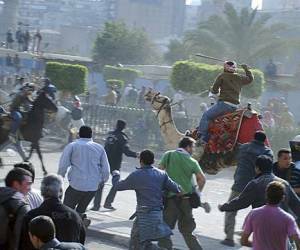 The Egyptian people rising up for liberation are being brutally attacked by thugs and police sent by the U.S.-funded Mubarak regime. Messages are coming from protestors under siege in Tahrir Square in Cairo calling on the people of the United States to support their struggle. It is an outrage that the U.S. government continues to send millions of dollars every day to prop up the Mubarak dictatorship. This regime has been dependent on U.S. aid for the past three decades. The people of Egypt are rising up against repression, poverty and dictatorship. We must stand with the people of Egypt and demand not one more penny to the regime. The U.S. gives $2 billion per year to prop up the Mubarak dictatorship. Egypt is second only to Israel as the largest recipient of U.S. “foreign aid.” That “assistance” has been used to buy the tear gas and other weapons and equipment that are killing Egyptian people attempting to exercise their right to protest and speak out. IN SOLIDARITY WITH THE PEOPLE OF EGYPT!